I worked as sound designer on this new piece of theatre written and performed by Francesca Millican-Slater. The show is “A live late night radio show for those that can’t sleep, aren’t asleep. Instead of records, this DJ is spinning stories that exist between dusk and morning. Small stories, odd, true, funny and familiar, reflecting the night hours themselves”. 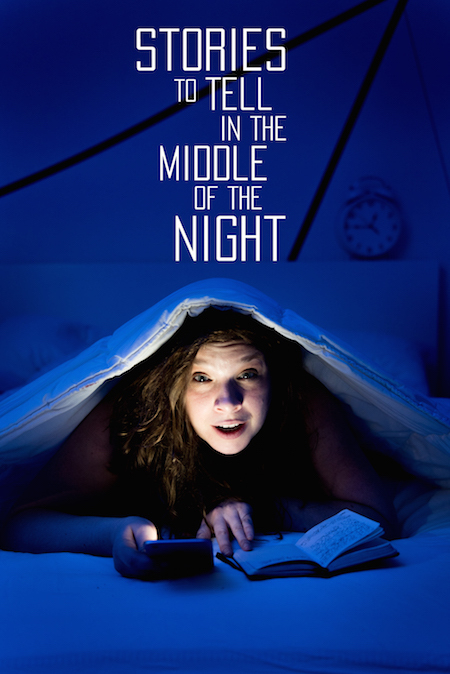 Following a successful run at the Edinburgh Fringe last summer Stories To Tell In The Middle Of The Night is playing at The Door, Birmingham Repertory Theatre from 9th – 18th February 2017. Please visit the REP website to book tickets. If you’d like a free taster of what’s in store, Francesca will be telling some of her stories in the REP basement until 7th Feb 2017. You can find out more info and book here. Look out for Stories To Tell In The Middle Of The Night at various venues around the West Midlands as, thanks to the Barry Jackson Trust, it will be touring until March 2017. For more information on this project, reviews and a video trailer visit my project page. Commissioned by Birmingham Repertory Theatre and produced by Pippa Frith. This entry was posted on Monday, January 30th, 2017 at 4:35 pm and is filed under Commissions, Sound Design, Theatre. You can follow any responses to this entry through the RSS 2.0 feed. You can leave a response, or trackback from your own site. … if the voices were only memories? Iain Armstrong. All Rights Reserved.